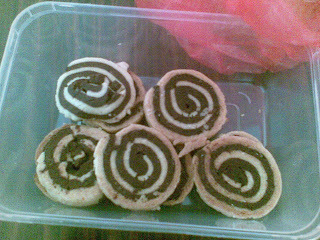 My Culinary (Mis)Adventures: Pinwheel Cookies! Took me 4 hours just to prepare, mix and roll the dough into a pinwheel shape before refrigerating it overnight (required in recipe). Some of them broke into pieces when i tried cutting the log into cookies before baking. Forgot to brush the egg whites between the doughs before rolling. Silly me. Tastes nice, and perhaps a tad too crunchy, but that's because I left them abit too long on the baking sheet, resulting the bottom being more cooked than the top.